Even before Nintendo announced it would cease production of the miniature, nostalgia-inducing NES Classic Edition console this spring, several rumors suggested it would only be a matter of time before the entertainment company launched a similar remake of the SNES. Well, it turns out the rumors were true and -- best of all -- that time is coming even sooner than you may have expected. 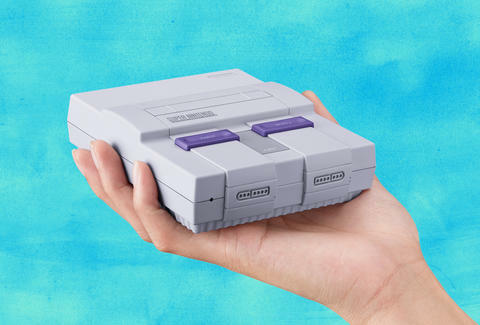 On Monday, Nintendo revealed that it's indeed launching an official remake of the Super Nintendo Entertainment System (SNES) of your childhood in the form of an equally mini SNES Classic Edition. The palm-size retro gaming system will start hitting store shelves in the United States on September 29 and will retail for $80, which is more than a month earlier than when the NES Classic arrived last year (November 11) and $20 more expensive. In other words, you may not have to wait until the holidays to spend days playing Donkey Kong Country like it's 1995. What's sure to be the best feature of the SNES Classic, though, is that it comes with two controllers for multiplayer games like Super Mario Kart, Contra III: The Alien Wars, and Secret of Mana, according to a press release. However, it looks like the controllers are wired despite complaints from NES Classic users and the numerous after-market wireless controllers that emerged for that system. Let's just hope the new controller wires are longer than the NES Classic's paltry 30 inches. The new console also connects to most high-definition TVs with an included HDMI cable. So far, Nintendo has made no indication of how many SNES Classics it's producing and what stock of it at retailers will be like when it launches this fall. The NES Classic was damn-near-impossible to get since the day it went on sale, leaving many -- if not most -- gamers to rely on surprise flash sales at some stores in the lead up to the holidays. Hopefully, there will be plenty of the tiny Super Mario Kart machines for everyone to enjoy come September 29. Tony Merevick is Senior News Editor at Thrillist and can play Donkey Kong Country for days. Send news tips to news@thrillist.com and follow him on Twitter @tonymerevick.